Eureka, CA (June 27, 2018) – A special Friday night event took place this past week at Redwood Acres Raceway. It was day two of the Redwood Acres Fair and the excitement could be felt throughout the entire fairgrounds including the 3/8-mile paved oval. 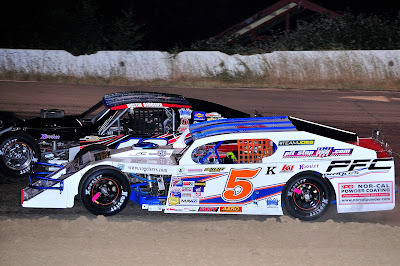 While the Fortuna Wheel & Brake bombers and the Mid-City Motor World late models were not in action, all four other divisions took to the track on Fair Night at the Races presented by Pepsi, Del Reka Distributing and Humboldt Lighting. 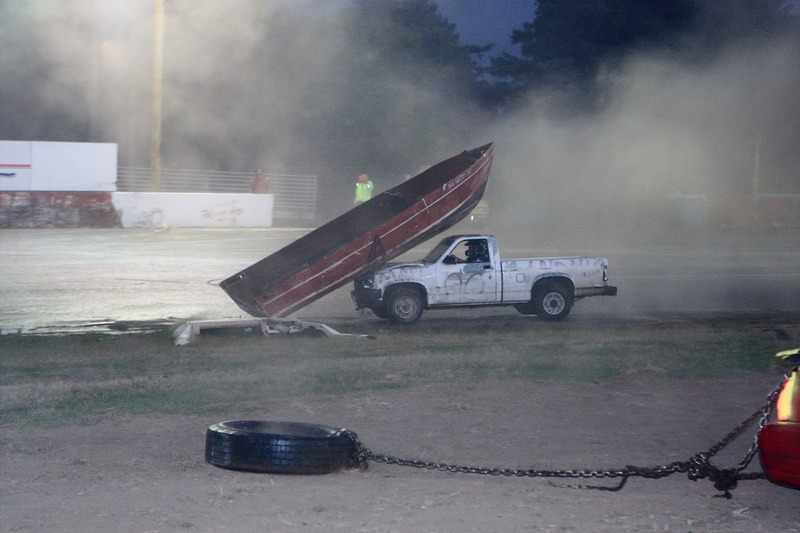 In addition, the night finished with a boat race which has become a big hit with fans in the past several years. Nick Ford was fast time in the Compass Community Credit Union roadrunner division with a 20.525. The first main was run in normal fashion and was a thriller from start to finish. Ford and Tim Ratzlaff traded the lead 10 times in the 20-lap main event. Ford was able to take the lead from Ratzlaff on the final lap to take the victory. Ronnie Crump was third with Jennifer Murrell fourth and Austin Peterson fifth. The second main event was run backwards and proved to be a completely different race. Ratzlaff dominated only losing the lead to Steve Kimberling with three laps left to go. Ratzlaff was able to retake the lead and crossed the line first. Kimberling was second followed by Crump, Andy Savage and Shawna Estes. Lane Anderson has displayed terrific pace in the first season for the Bandoleros. Anderson was fast time with a 21.706. Anderson took the trophy dash while Maleesa Miles hung on to win the heat. Kadence Mace led the first lap of the 15-lap main event. Lap two saw Anderson take over. From that point on, Anderson was able to run away from the rest of the field to victory lane. Miles placed second followed by Mace, Trey Daniels and Aiden Kimberling. The NorthCoast Lighting & Electric Legends division had a great turnout for the evening. Chris Lawrence has become the main to beat in the division this season. His qualifying time of 18.133 was fastest of all. Tyler Peach was the heat race winner while the two heat races were won by Katina Baker and Lawrence. The main event was a race to see how fast the quicker qualifiers would be able to maneuver through the field. Kylie Daniels showed great speed and led the majority of the race. Lawrence quickly sliced through the field to get second on lap five. Daniels and Lawrence had a fantastic battle for the lead with both drivers displaying great patience. On lap 19, Lawrence took the lead and was able to pull away. At the finish it was Lawrence beating Daniels, Peach, Tyler Krupa and Katina Baker. The Humboldt Hydroponics mini stocks had a special 40-lap main event on the night. Brian Murrell, Sr. was quickest in qualifying with a time of 18.846. Gary Klientobe took the trophy dash win. Heat race victories were claimed by Jordan Paiment and Klientobe. Paiment took the lead at the start of the main event. Things got jumbled five laps into the race when Brett Murrell’s hood got loose and blocked his windshield. While he was able to get to the pits, Paiment was able to put a major gap on the field while faster qualifiers like Murrell, Sr. and Eugene Palmer lost significant track position. It appeared as nobody had a chance of catching Paiment but a caution flag on lap 20 completely changed the complexion of the race. Klientobe cut a tire and spun out. Then a battle for second between Trevor Eacret and Scott Taylor resulted in Eacret’s truck being disabled, bringing out the caution. Paiment still held the lead on the restart but had Taylor and Palmer right on his heels. As the race drew closer to the checkered flag, things tightened up at the front. On the last lap, Paiment and Taylor were nose-to-tail going into the first turn. Coming off turn two, Taylor got into the back of Paiment who spun. Third place Palmer also got collected. Murrell, Sr. was able to get through the mess and was able to cross the finish line first after being in the fourth position on the white flag lap. Klientobe was able to recover from his flat tire to get second. The next three positions were determined by scoring on the previous lap as none of the drivers were able to make it back to the line. Paiment was credited with third over Palmer and Taylor. Following the mini stock main event was the crowd-pleasing boat race. At the end of the carnage, the top three finishers were winner Armand Deny, second place Matt Taylor and third place Mark Murray. The next race in the 2018 season for Redwood Acres Raceway is Saturday July 7th. The big event for the evening will be the Don Graham Memorial Firecracker 100 for the Mid-City Motor World late models. There will be a test and tune on Friday July 6th. Another big event will happen after the races with a spectacular fireworks display. Eureka, CA (June 26, 2018) – The Humboldt Outlaw Karts had its biggest race of the season with Automotive Workshop & Fabrication presenting the night’s action. The June 21st race was a Thursday night special on opening night of the annual Redwood Acres Fair. In addition, entry to the event was free for fans. Many in attendance were able to see outlaw kart racing at Redwood Acres for the first time, including numerous young fans. There was additional incentive for drivers in all six divisions. The top four finishers in the main event would enter a six-lap Dash 4 Cash race with the winner receiving $100. The heat race for the Champagne Attorney Service beginner box stocks was won by Corbin Green. The main event went green with Chayce Smith moving to the lead. A spin by Danica Kinsey bunched the field. There were several other cautions in the race including a multi-kart accident in turn four. Even with the restarts, Smith was able to pull away from the pack each time. At the finish it was Smith winning followed by Green, Aaliyah Mitchell, Kinsey and Myer. The Dash 4 Cash race was caution-filled but the end result was similar to the main event. Smith took the $100 victory over Green, Mitchell and Kinsey. The Williamson Financial Group box stocks had two heat races with Dylan Combest winning the first heat and Brady Osborn taking the second. Colton Kinsey led the opening stages. Derek Kessler spun in turns three and four to bring out a yellow which brought the field together. Combest used the restart to his advantage as he was able to take the lead. Spins by Bryce Johnson and Sonya Osborn slowed the race. Under caution, Kinsey had issues which forced him to retire from the race. The restart saw Combest leading followed by Connor Jones and Janice Walters. In the final handful of laps, Walters slipped off the track costing her several positions. Combest was able to hold off Jones for the win. Timmy Walters was third followed by Brady Osborn and Sonya Osborn. The initial lead in the box stock Dash 4 Cash was held by Brady Osborn. Timmy Walters slid off track and Osborn did the same. Jones moved to the lead and was able to fend off Combest for the $100 victory. The Wes Green Landscaping 125/200cc kart heat went to Braden Weiser. MKinzy Uselton jumped to the lead at the start of the feature but a spin by Braden Weiser forced a restart. Body Weiser took advantage to take the lead over Landen Green. The front two were close for a time but as the race wore on Body Weiser was able to pull away. Maleesa Miles’s spin closed the field while a spin by Uselton also necessitated a caution. They did not prevent Body Weiser as he was able to take the checkered flag over Braden Weiser, Landen Green and Uselton. The Dash 4 Cash race as Uselton spun in turn three while Green and Body Weiser also spun off the second turn. Braden Weiser was able to avoid adversity to take the win followed by Body Weiser, Green and Uselton. Nick Ford was the winner of the Fortuna Wheel & Brake old far karts. The main event was dominated by Ford. An early spin by Sara Cox slowed the field. The caution flew again when Amanda Harp turned around. Ford was able to lead wire-to-wire for the win. Harp, Cox and Foster rounded out the finishers. The start of the Dash 4 Cash saw Foster and Cox spin off the second turn. Foster led the restart with Ford closing quickly. Foster was able to fend off all challengers for the victory over Cox, Ford and Harp. The NorCal Automotive 500cc/open karts had a nice turnout with Daniel Whitley winning the heat race. Wayne Fisher grabbed the lead at the start of the main. A spin by Tony Miles and Cliff Myer. Whitley took the lead on the restart and looked to be the driver to beat. The race was slowed by a Wayne Fisher spin. The biggest incident of the night came when Fisher spun off turn four. Miles also slid off track causing his car to roll over. Miles was able to drive his kart back to the pits but wasn’t able to return to the race. The rest of the race proved to be a formality for Whitley as he was able to cruise to the victory. Anissa Curtice and her father Brad Curtice had a race-long battle with Annissa taking the second-place finish. Fisher was fourth while Miles was credited with fifth. It didn’t take long for Whitley to move to the lead in the Dash 4 Cash. By the end of lap one he was able to take the lead from Fisher. Anissa Curtice spun from the third position for a caution but it didn’t prevent Whitley from taking the win. Brad Curtice took second over Fisher and Anissa Curtice. Pete Michlette was the winner in the Michlette Family Racing real stocks. The main event saw Jordan Michlette move to the lead over Tim Crenshaw. Several cautions slowed the race and allowed Tim Crenshaw to inherit the top position. Crenshaw never lost the lead even though Pete Michlette made a hard charge in the final few laps. At the checkered flag it was Crenshaw winning followed by Pete Michlette, Jordan Michlette and Alex Kinser. The Dash 4 Cash was a formality for Jordan Michlette as he led from start to finish beating out Pete Michlette, Crenshaw and Kinser. It was a bittersweet ending at the conclusion of the races as it was the final event to be held on the 1/10th-mile dirt track inside the 3/8th-mile paved oval. Thankfully racing for the Humboldt Outlaw Karts will continue to be held at the fairgrounds. A new track inside the old rodeo arena will be the new home for the outlaw karts. Unfortunately, the next race which was scheduled for Saturday July 14th has been cancelled. Officials are working on rescheduling the event. 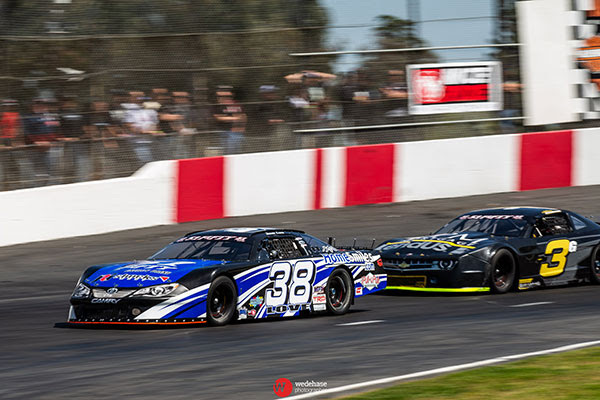 MADERA, CALIFORNIA (June 25, 2018) – Both the RPM Mortgage Pro Late Model Series and the 51FIFTY Energy Drink Junior Late Model Series return to Madera Speedway this weekend to headline the “Reverend Ron Spencer Red, White and Blue Classic” featuring post-race fireworks. The MAVTV-televised series will be joined on the one-third mile asphalt oval by 48 lap races for the Modified Super Toyotas and Toyota Sedans plus the Mini Cups vs. Bandoleros series. Over 300 laps of stock car action will be presented in honor the late Ron Spencer, who was the long time track chaplain before passing away last year. The MST and Toyota Sedans extra distance races are a tribute to Jeff Doran as well. 15 year-old Austin Herzog leads the RPM Mortgage Pro Late Model Series points despite not visiting victory lane yet this year. The Clovis driver finished third in May and second in April. The six-time Jr. Late Model winner enjoys a 22 point lead over former champion Matt Erickson of La Grange. Modesto’s Garland Tyler is third in the standings followed by a surging Racin Vernon of Bakersfield. Vernon picked up his first victory with the series during Military Tribute Night to move up to fourth in the championship. Dos Palos’ Ryan Hart rounds out the top-five. A strong 16 car field competed in last weekend’s Madera Late Model Series non-TV race with Bakersfield’s Buddy Shepherd grabbing the win. Over 30 Pro Late Models are expected this weekend including a double duty effort from Kayla Eshleman in both Pro and Jr. Late Models. $500 will go to the winner of the 25 lap B Main before the 80 lap feature that is split over two segments for $2000 to win. Winning two of the four races so far, Jesse Love IV of Menlo Park has extended his points lead in the 51FIFTY Energy Drink Jr. Late Model Series. Love is looking to become the series’ first repeat champion. He is followed by fellow two-time winner Dylan Zampa of Napa. The 14 year-old is 18 points behind Love. Las Vegas’ Tanner Reif has drifted to third, 32 points behind, with the top-five rounded out by Bakersfield’s Kabe McClenny and third year driver Austin Edwards. An 80 lap feature is scheduled for these drivers ages 10-16 years old. Rounding out the MAVTV-televised divisions is the upstart Mini Cup vs. Bandoleros series. Bakersfield drivers have dominated this “race within a race” competition with Kercie Jung, Riley Massey, and Seth Wise all scoring Bandolero wins. Bakersfield’s Kale McClenny won the first three Mini Cup races but an incident late in the May race allowed Placerville’s Jayce McArthey to get his first career Mini Cup main event win. The youngest racers at Madera Speedway will compete in a 20 lap feature. Patrick Geiger leads the Modified Super Toyota standings as the division heads into its longest race. The 48 lap feature is split across two 24 lap segments. Geiger’s lead over Ryan Reynolds is 18 points with 2017 champion Bert Stephens only 19 points out of first as well. Shaun Reynolds picked up the most recent MST victory. 2016 Toyota Sedan champion Jillaun Holden has had little issue with the growing fields in the division, charging to six main event wins this year. Her points lead stands at 73 over Thomas Magray with rookie Greg Tyler rounding out the top-three. Their 48 lap event is also spread across 24 lap segments. Action gets started on Friday evening with practice from 5 p.m. – 8 p.m. Saturday’s program begins with pit gates opening at 10:30 a.m. Practices run from 12:15 – 2:15 p.m. with qualifying and heat races to follow. The first set of main events starts at 4:15 including the Mini Cup feature and the Late Model B Main. Opening ceremonies are at 5:30 p.m. The huge fireworks show will take place sandwiched in the middle of the program at approximately 9 p.m. with the 30 lap conclusion for the RPM Mortgage Pro Late Model feature immediately following. Tickets for this busy night of racing are just $15 for adults, $13 for seniors, $7 for youth ages 6-12, and kids five and under are free! Madera Racing on MAVTV airs Thursdays re-runs of the 2017 season every week. The show airs at 5 p.m. and 8 p.m. PST and is also available on the Lucas Oil Racing TV app. Round #2 of the RPM Mortgage Pro Late Model Series from April airs on Thursday July 5th. Tellstrom also clocked in fastest in the 20 car field with a 13.430 second lap, earning another $100 from WLM&D. The starting grid for the main event saw a four-car invert placing Price on the outside of Dustin DeRosier of Cloverdale in the front row. Defending NSMS champ, Darrin Knight of Kelseyville, driving for Terry Deal in the #01 modified, shared row two with Tellstrom. Madera Speedway winner Cameron Austin of Santa Rosa and Redwood Acres Raceway winner Jason Philpot of Sacramento started in row three. DeRosier led the first round with Price up front on lap two. The race was slowed on three for a spin by Mike Neilson in the first turn. When racing resumed Price took control with Tellstrom diving under DeRosier for second. Three rounds later Knight snuck under DeRosier as Darrin Sullivan, Philpot and Oregon's Randy Houston were battling for position. Lap 8 saw Donovan Cox's car on fire, and after the safety crew stopped the continued sparking in the engine compartment, Cox's #13 was towed to the pits. Price continued to pull Tellstrom on the double-file restart as DeRosier and Knight jockeyed for position behind the leaders. Another yellow flag flew on lap 12 when Bryan Denton lost control and spun in turn four. At the same time Sal Lopez retired to the pits. Price held off Tellstrom another19 circuits until they caught the back of the pack where Neilson and Rich Cobb were running side-by-side. Tellstrom drove low and Price chose the high side. Price attempted to squeeze through the slower cars when contact was made, cutting his tire. The yellow flew again allowing Price to pit, change the tire, and return to action at the back of the pack. Three rounds later Houston pulled into the infield with mechanical problems. Lap 38 saw Sullivan's engine stop to slow the action again. A lap 42 crash involved Denton, Eric Johnson and Neilson. Two rounds later, Kris Price was working his way through traffic, when he drove into turn one too hard and his car went off the track. Eric Price ended his run on lap 47, and Rick Avila drove to the pits on 52. 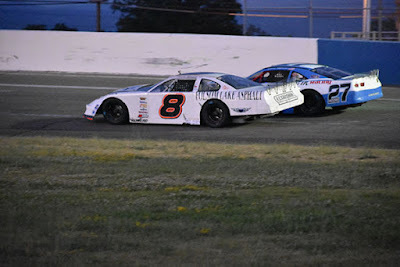 With only five laps to go, Kris Price was attempting to pass Bloom when the two cars made contract resulting in Bloom's car pushing up the track. Flagman Johnny Miskill stopped the action, and while under yellow both Bloom and Price were black-flagged for rough driving. The final five went without incident with Tellstrom first across the Sunoco checkered flag followed closely by Knight, DeRosier, Philpot and Austin. Rounding out the top 12 were Young, Elliott, Denton, Cobb, Johnson, Strugnell and Neilson. Philpot took over the NSMS points lead with two points over Kris Price. DeRosier moved into third place with Johnson fourth and Terry Deal fifth. Johnson collected $100 for his win in the Lucas Oil Dash for Cash with Eric Price taking home $50 for second. Young earned the Keyser Hard Charger award for passing the most cars. Elliott won the Naake Shocks certificate, and the Frank's Radios awards went to Tellstrom, Knight and DeRosier. The Scribner Plastics jugs went to Johnson and Eric Price. Race #5 of the North State Modified Series “Driving Out Cancer Tour” will be on July 9 at All American Speedway at Roseville, CA. WLM&D TIME TRIALS: Kyle Tellstrom (13.430), Darrin Knight (13.485), Kris Price (13.534), Dustin DeRosier (13.536), Cameron Austin (13.577), Jason Philpot (13.589); Randy Houston (13.595), Darrin Sullivan (13.626), Eric Price II (13.791), Mike Neilson (13.832), Ian Elliott (13.835), Eric Johnson (13.838), Keith Bloom (13.845), Sal Lopez (13.865), Guy Young (13.866), Bryan Denton (13.872), Rich Cobb (13.907), Donovan Cox (14.144), Adrianna Strugnell (14.143), Rick Avila (14.246). LUCAS OIL DASH FOR CASH: Eric Johnson, Eric Price II, Ian Elliott, Keith Bloom, Mike Neilson, Randy Houston. SUNOCO / WLM&D FEATURE EVENT: Kyle Tellstrom, Darrin Knight, Dustin DeRosier, Jason Philpot, Cameron Austin, Guy Young, Ian Elliott, Bryan Denton, Rich Cobb, Eric Johnson, Adrianna Strugnell, Mike Neilson, Keith Bloom, Kris Price, Rick Avila, Eric Price II, Darrin Sullivan, Randy Houston, Sal Lopez, Donovan Cox.